What happens to a modern airliner when it's struck by lightning? Well... not much actually. 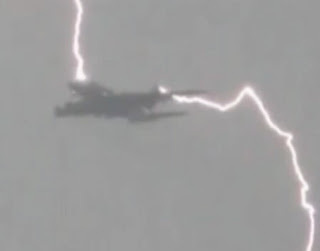 Modern airlines are quite safe, even though, statistically, every single plane is struck by lightning once every year. But the new generation of planes, like the Airbus A380, are no longer being made with metal. Weight saving is paramount. So manufacturers are going for carbon fibre. And carbon fibre disintegrates when struck by lightning. See how Airbus is working to prevent future disasters in this BBC clip.